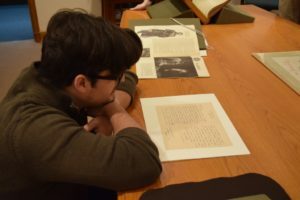 Folger Shakespeare Library is a remarkable place, with a vast collection of items related not just to Shakespeare but also to his time, to the intersections between his plays and history, and to theater history in general. Cast and company members of Folger Theatre productions get to experience the library’s expansive holdings through small tours arranged by our Research and Reference Librarian, Abbie Weinberg. 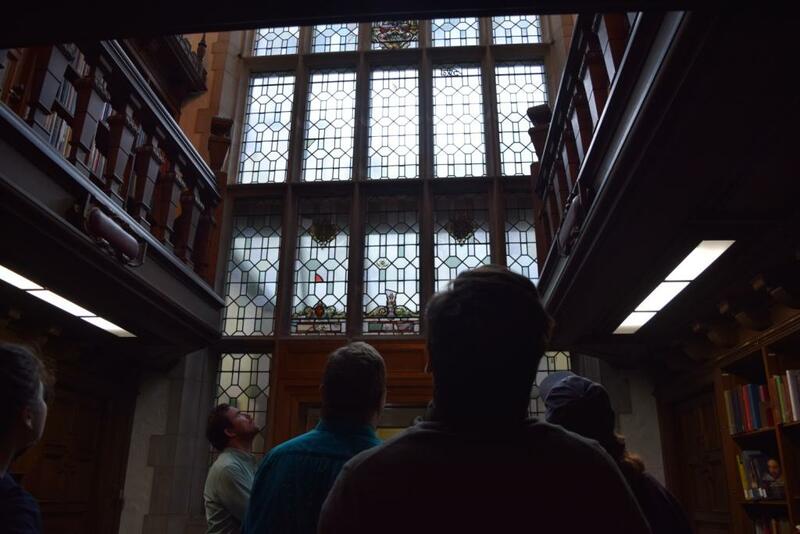 Today, Folger Spotlight gives you a sneak peek at what was brought out from the collection to share with the Saint Joan company on one of these special tours. The tour began with a little bit of building history, starting in the Founder’s Room (originally intended as an apartment for Library founders Henry and Emily Jordan Folger). Among the many items on display is a bracelet made from the hair of noted Shakespearean actor (and brother to John Wilkes Booth) Edwin Booth. 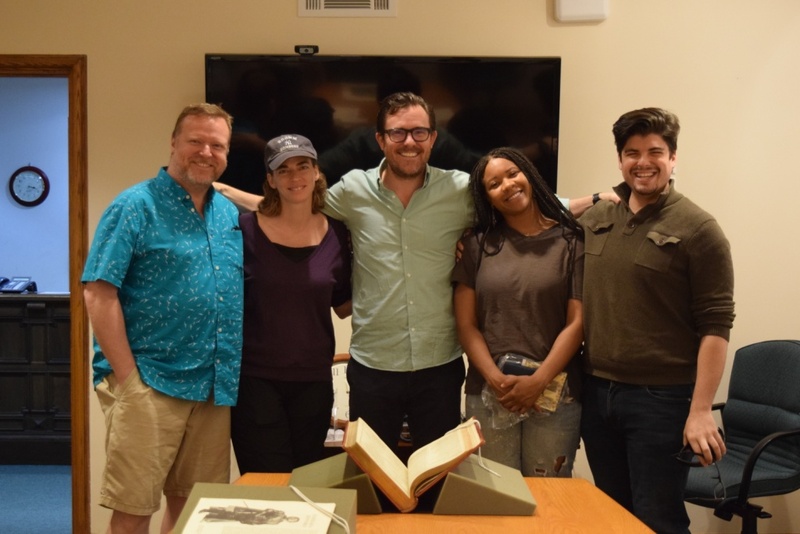 The company then traveled through the Paster Reading Room, where scholars from all over the world come to use the library and study the Folger’s rich materials. This area is usually closed to the public, but if you’re curious about the stained glass depicting the “Seven Ages of Man” or seeing the largest painting in the Folger collection—a scene depicting Juliet awaking in the Capulet tomb—tours are available on the weekends. Be sure to wave to the Folgers, whose portraits can be found at the far end of the room. 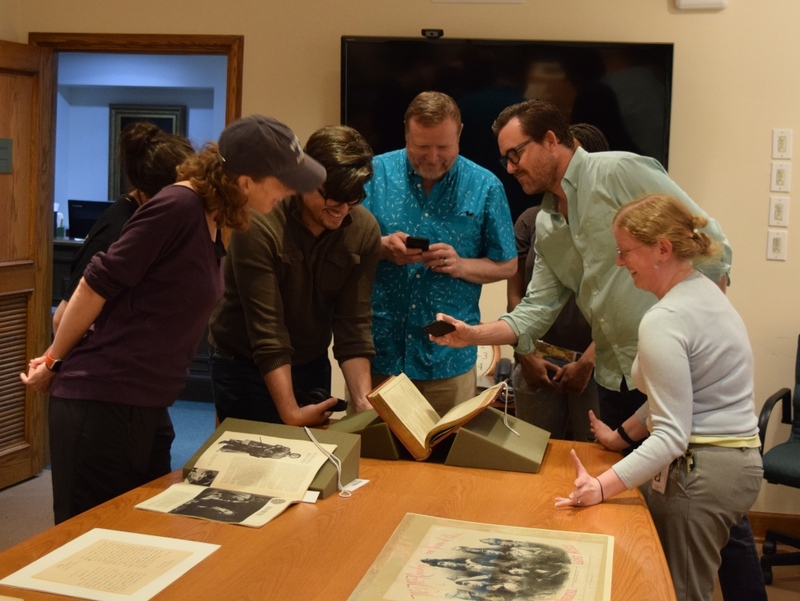 Diane Healy, Sam Massaro, Edmund Lewis, Eric Tucker, and Abbie Weinberg looking at a First Folio. The tour continued into the staff corridors and down to where a number of treasures from the collection had been set out. While most of the items were chosen based on a relationship to Joan of Arc and/or George Bernard Shaw, a First Folio was also on display. Printed in 1623, the collection of plays preserved Shakespeare’s work for future generations, including those that had not previously been published such as Macbeth, Antony and Cleopatra, and Twelfth Night. Being in the same room as this cultural touchstone always produces strong emotions (people have been known to get teary), and the effect on the Saint Joan company was no exception, with all crowding around to get a good view of this invaluable book and snapping pictures of favorite lines on the page. Typescript of The Dark Lady of the Sonnets, produced by Peter Creswell, 1938 April 22. Sam Massaro, Diane Healy, Edmund Lewis, Eric Tucker, and Dria Brown look at a letter written by Shaw. Photo: Ben Lauer. A letter written by George Bernard Shaw. The philosophy of ‘Hamlet’ by Thomas Tyler with manuscript notes by George Bernard Shaw. Photo: Ben Lauer. Sam Massaro and a letter written by George Bernard Shaw. Photo: Ben Lauer. Actor Sam Massaro was especially taken with the letter, which includes scratched out writing indicating the great playwright, too, was prone to make mistakes now and then. There were also a number of depictions of Joan through the ages, including illustrations of actresses portraying the saint in Shakespeare’s King Henry VI, Part 1 and a poster advertising Mrs. Clara Rousby as Joan in Tom Taylor’s play by the same name. A personal favorite of Abbie’s, a 19th-century watercolor of Joan by John William Wright (or was it? ), rounded out the survey of Joan through time. Miss Stuart in Joan la Pucelle [in Shakespeare’s] Henry VI, pt. I, act I, sc. 6. Print by George Simon Harcourt. Folger Shakespeare Library. King Henry VI [part 1], act I, scene II [graphic]. Felix Octavius Carr Darley, Folger Shakespeare Library. Mr. & Mrs. Rousby in Joan of Arc [by Tom Taylor] [graphic] / Grouped and lithographed by Maclure & Macdonald. Folger Shakespeare Library. Joan of Arc from ‘Heroines of Shakespeare,’ watercolor, John William Wright. Folger Shakespeare Library. 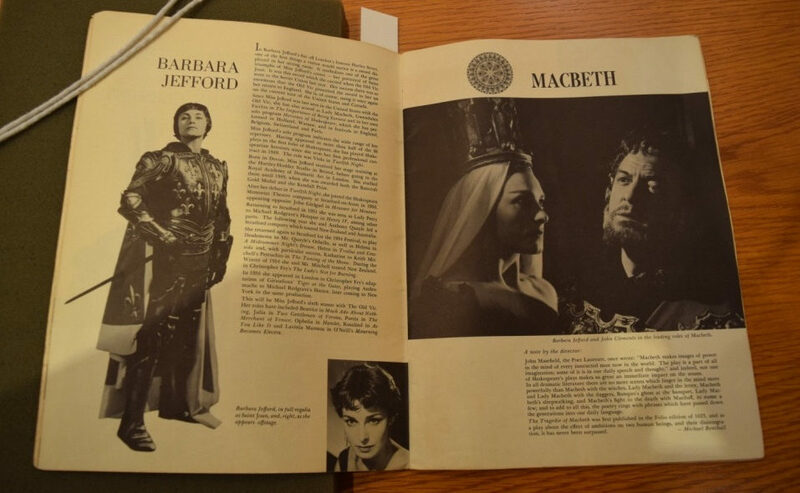 There was even a souvenir program for the Old Vic North American Touring Company’s production of Saint Joan in 1962, featuring Barbara Jefford in the title role. Souvenir program for the Old Vic North American Touring Company’s 1962. Folger Shakespeare Library. All in all, it was a wonderful afternoon spent exploring the treasures of the Folger Shakespeare Library and reflecting on the power of George Bernard Shaw’s classic play. Thanks to Abbie Weinberg for arranging everything, and to the company of Saint Joan for letting us tag along! Edmund Lewis, Diane Healy, Eric Tucker, Dria Brown, and Sam Massaro. Photo: Ben Lauer. 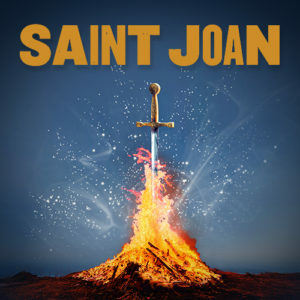 Don’t miss your chance to see Saint Joan before it closes June 10. For tickets and more information, visit us online or call the Folger Box Office at 202.544.7077. Directed by Eric Tucker; costume design by Eric Tucker; lighting design by Les Dickert.